A 4-Inch (102 mm) Refractor Can Be An Excellent Deep-Sky Telescope: Finally Sirius B, Barnard’s Galaxy, and Much More…. After more than twenty years, I finally replaced the original 6 x 30 finder on my 102 mm refractor, with a larger 8 x 50. A larger finder makes it much easier when attempting to find the exact location of that very faint deep-sky object. At current, I’m working my way through another double Star list, taking my time to sketch each double, noting the colors, checking the position angle and also drawing selected field stars. I’m using a correct image 90º diagonal. The view through a standard 90º diagonal, whether using a refractor or Schmidt-Cassegrain makes it virtually impossible to correctly draw a deep-sky object. The mirror-reverse image as seen through a (90º diagonal) does not allow me to draw the objects scientifically correct. I like to make all my sketches showing north at the top and west to the right. Documenting my deep-sky objects over the years has been very rewarding. The following represents some of my observing notes, sketches, and articles. Visual detailed sketching: Observing an object through a telescope via an eyepiece. Drawing the object on paper “as verbatim” as possible using a pencil, chalk or other. Impression astro-sketching: A sketch made at the eyepiece, using a pencil, chalk or charcoal and representing what the observer mentally perceives, without a great degree of scale or detail. Want to know more about this type of sketching? Pull out your copy of the “Messier Album” by John Mallas and Evered Kreimer. Computer-enhanced sketching: An astro-sketch generated using a computer, from “sometimes” a rough pencil sketch. Now it’s my opinion….why bother, just find a beautiful image and get permission from the APer to use, always giving full credit. However, if you choose this system, please let it be known to your readers, that it is a computer assisted drawing, and not a pencil sketch via the eyepiece. The following represents a few of my “visual detailed pencil sketches” seldom using anything more than a No.2 pencil and a blank 5 x 8 notecard with a three inch circle. I wanted to include a picture of my “vintage” Meade model DS-10A f/4.5 reflector telescope. It has served me well since my purchase back in February 1992. Five years later in 1997, I purchased my 102 mm Orion/Vixen f/9.8 achromatic refractor. This might prove that a lifetime of enjoyment as an amateur astronomer can be enjoyed with “humble” telescopes, but of good quality and not necessarily the most expensive ones. And remember…..the telescope that’s used the most is the best telescope. How did I become interested in this famous star and its faint companion? I purchased my first serious telescope in 1977, which was a 4 1/4-inch f/10, Edmund Scientific reflector. Even though this was not my first choice for a telescope, it was the best my budget would allow at the time. My first choice would have been the 6-inch Edmund f/8 EQ (Super Space Conquerer) reflector. I started reading anything and everything about astronomy, and was fortunate to find “The Edmund Sky Guide” by Terence Dickinson and Sam Brown. In this book was a paragraph concerning Sirius and its companion which caught my attention. Double stars were something new to me at that time. Due to the extreme and overwhelming brightness of Sirius as compared to the much fainter companion, it can be extremely difficult to see the dimmer star. I tried for at least a couple of years in a feeble attempt to see the companion (a.k.a the “Pup” or Sirius B) with my humble 4 1/4-inch Edmund reflector, but without success. During the fall of 2011, double star expert, astronomy author and lecturer, James Mullaney, informed me that he had heard of an amateur being able to see the companion using a 4-inch refractor. When Sirius B was at a relatively wide separation during the 70’s, again, I was using a spherical mirror, 4 1/4-inch f/10 reflector, not exactly the preferred telescope for accomplishing this feat. Last night (March 14th 2012) using the refractor, I made preparations to observe Sirius. After letting the telescope cool down for at least an hour and making a few visual test….the seeing was excellent! My excitement was building as it had been a long time since first reading about Sirius and Sirius B so many years earlier. I had casually observed Sirius on many occasions over the years with a variety of telescopes, but never seriously looking for, or expecting to see the companion. After adjusted my astro-chair, and removing the diagonal, I started with a magnification of 83x, but to no avail. I increased the magnification to 232x….keeping my eye perfectly still. It was very surprising to see a beautiful airy disc surrounding Sirius. It was quite amazing…no turbulence, and Sirius was almost pin-point, not the large bloated star that I was so used to seeing over the years. I looked very carefully for a few minutes, and there it was! After almost 40 years, I had finally seen the companion to Sirius. It was not possible to hold Sirius B constantly, but was winking in and out…..difficult indeed! I had glimpsed Sirius B the previous month (February 2012) but conditions were not all that good, and just had to have another observation to confirm my sighting. One of my first reference books was “The Finest Deep-Sky Objects” by James Mullaney and Wallace McCall. I had observed all 105 objects many times, accumulating over 600 or more, 3 x 5 note cards, complete with notes and sketches. However, one of the objects of this list was missing…the companion to Sirius. After my visual sighting of Sirius B, I now have notes and sketches of all objects listed in that wonderful list of deep-sky objects. After seeing Sirius B, I went to bed smiling, as another observing goal had been accomplished. It was a great feeling. Have you seen Sirius B, better known as the Pup? Why not give it a try? I have always been interested in the possibilities of using a small telescope, especially a good quality refractor. A refractor can present pin-point star images and a velvety black background which can improve the contrast of most deep-sky objects. The superior contrast of a refractor can often times allow views of deep-sky objects that rival or even exceed larger telescopes of more complex designs. It should also be noted that a very low surface brightness, extended object can often times be better observed at low magnification with a small refractor. 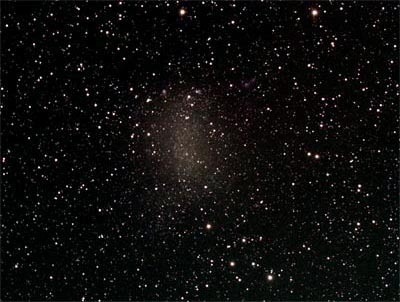 A good example of this would be NGC 6822 (Barnard’s Galaxy) in Sagittarius. “A weak glow but definite glow in 6 cm, where it appears elongated N-S and shows a very slight central concentration. In 25 cm motion of the field helps in showing the low surface brightness galaxy, but it is difficult and ill-defined at best.” Observing Handbook and Catalog Of Deep-Sky Objects by Christian B. Luginbuhl and Brian A. Skiff. Finally…after almost 25 years (many years I attempted with my 10-inch reflector) but had never been successful. In September 2014, I was able to sketch and make notes of this elusive galaxy, NGC 6822, using the 102 mm refractor. Much of my problem has been due to light glow from a pesky unshielded street light in close proximity to my backyard. A dark sky is critical for locating and observing this faint low surface galaxy. And so, another difficult object checked off my list. The following sketch was made using the refractor with nothing more than a No. 2 pencil, a blank 5 x 8 notecard, with the colors inverted using a scanner. The following image: Courtesy of Dr. James Dire of Hawaii using a 190 mm Orion Maksutov-Cassegrain telescope. I like the descriptions by the authors describing the views with various telescopes, especially with a 60-mm refractor. This causes me to want to follow their observations and see what’s possible for me using a 60 mm refractor, however, I don’t have one. No problem. I have a home-made 60 mm stop-down mask for use with the 102 mm refractor. This allows me the opportunity to observe the object with a 60 mm refractor, without having to add another telescope. I can then make visual observing notes and sketches for two scopes. Polaris has a magnitude of 2.1 and the secondary or companion at a much fainter 9.0 magnitude with a wide separation of 19 arc seconds. The extreme difference in magnitudes can make this double more difficult to separate than you might think, especially if seeing is less than good. April 19th 2018: 102 mm Orion/Vixen f/9.8 achromatic refractor with an effective aperture of 60 mm’s. Seeing excellent: 12.5 mm eyepiece plus 2.8x Barlow for a magnification of 80x. The companion was clearly visible as a tiny bluish dot. What is the smallest aperture that will allow me to see the companion to Polaris? The following photo shows an effective aperture of 45 mm’s. However, as of current, I’ve been unable to see the companion with this aperture…. When observing with my CT80 or 102 mm refractor, I always use a 1.25-inch correct image diagonal. For me it’s essential when sketching a deep-sky object, to have the correct orientation in the eyepiece field-of-view. April 20th 2018: Orion 80 mm (Model CT80) f/5 achromatic refractor. Similar conditions to my observation on the 19th. Using the same eyepiece combinations (90x) and was able to easily see the companion as a tiny bluish dot. A great little scope which is very easy to take outside, with mount all together. If time is limited….maybe an hour or less, this is the telescope I use. My older brother purchased a 60 mm f/15 EQ Jason Refractor in the mid-60’s, when I was only thirteen years old. This was the telescope that got me interested in astronomy. I would set it up in a weedy field beside of my house in a very rural area of the foothills of North Carolina. I had difficulty finding anything other than the moon, Venus, Saturn and Jupiter, but eventually my observing skills did improve. I’m really glad that I persevered and stuck with it. I have always kept the lens capped on the 102 mm refactor, when not in use and the OTA is always stored in a padded case. In the eighteen years that I have owned this telescope, the objective lens has never required cleaning. The objective lens is also permanently collimated, without any adjusters, and was in perfect collimation when I received it. There has been no change after more than twenty years of use. For most part, a refractor is much more durable and able to suffer less from mishandling and rough treatment than reflector’s and catadioptric telescope’s. A very high quality 4-inch refractor during the 50’s through the 70’s, had to be a Unitron, with the standard f/15 focal ratio. The long focal length was necessary for an achromatic refractor telescope… to reduce false color. This telescope could be obtained with either of two mounts. One being a field tripod with wooden legs, and the other….a massive bell-shaped pier with a mechanical weight-driven clock drive. The latter was designed for a permanent location. A 4-inch f/15 refractor with any type of equatorial mount for most part should not be considered a portable instrument. 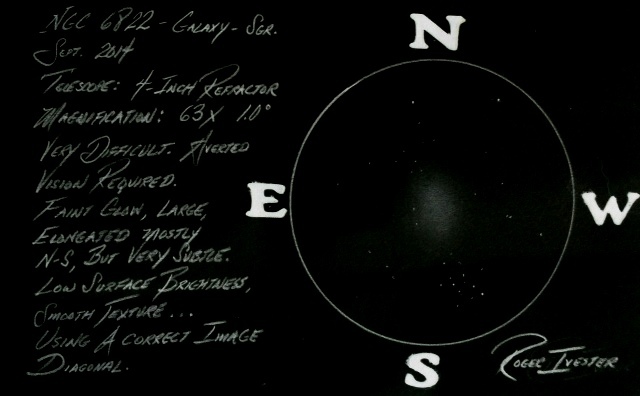 John Mallas who co-authorded “The Messier Album” with Evered Kreimer, used a 4-inch f/15 Unitron to examine all Messier objects between 1958 and 1962, from Covina, California. This is a fabulous book and I still use it as a reference quite often. This entry was posted on May 23, 2010 at 3:20 am and is filed under Roger's Articles. You can subscribe via RSS 2.0 feed to this post's comments. Both comments and pings are currently closed.